Probably owing to the formation of the circum-Antarctic current after separation of South America and Australia from Antarctica, the Paleogene witnessed global cooling (Berggren and Prothero 1992). Changes in continental geography owing to plate tectonics and sea-level fluctuations further influenced faunal interchanges between major geographic areas. A great number of publications have dealt with the effect of these events on mammalian evolution (e.g., Janis 1993; Cox 2000; Rose 2006), but their impact on Paleogene avifaunas is still poorly understood. Even fewer published data exist on ecological aspects of Paleogene bird communities, such as competition with mammals or between avian taxa. 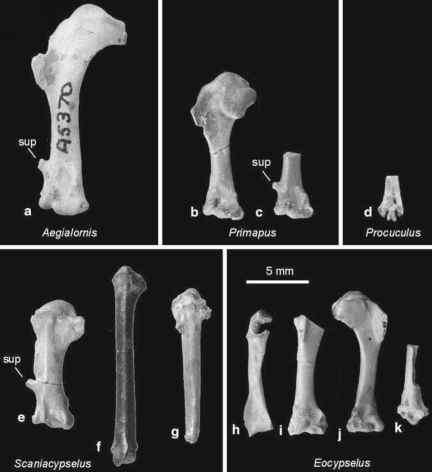 In the following sections some general aspects of the evolution of Paleogene avifaunas which pertain to these issues are outlined. The temporal distributions of major fossil taxa are summarized in the tables in the Appendix and form the basis of some of the subsequent notes.